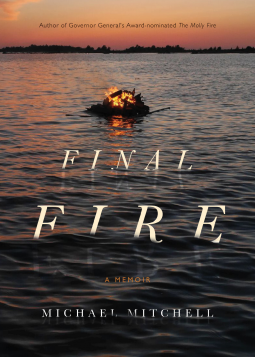 Final Fire is a companion piece to Mitchell’s much-praised 2004 memoir, The Molly Fire, a finalist for both the Writers’ Trust Drainie-Taylor Biography Prize and the Governor General’s Award for Non-fiction, and a Globe and Mail Best Book of the Year. Nearly a half century ago, Mitchell abandoned a safe and secure academic career to become a “cowboy” with a camera and a keyboard. While he has always kept one foot planted firmly in the arts, as a working photographer his search for adventure took him through the Americas, into the High Arctic, across Europe, on to the Middle East, India, and the Far East. He photographed famous athletes, musicians, actors, politicians, revolutionaries, and more than a few criminals. The sum of these scary, strange, heartrending, and funny episodes is one man’s prescription for how to live in a bizarre and, best of all, never boring world. It is also a book about loss. Mitchell reflects on the invention of photography and its transformative effect on world culture and pays tribute to fellow photographers who led remarkable and frequently obsessive lives. Interesting and informative read, I definitely know a lot more about photography after having the chance to read this book.